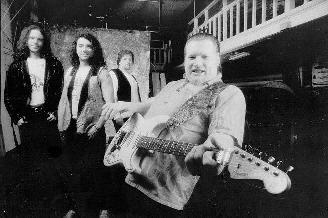 Johnny Nitro and the Doorslammers is San Francisco's leading blues rock band. Led by Johnny Nitro, the group performs regularly at popular clubs around the city. The group has two albums out, Drinking Triples 'Till You're Seeing Double and Car Fixin' Blues. In addition, Johnny Nitro is featured on a third album, the San Francisco Blues Guitar Summit, Volume 3. Mindy Giles and Stephen Green selected Johnny Nitro as one of the subjects for their book Really the Blues. This collection of photographs features many great blues artists at work. Pick up a copy for your coffee table or recording studio. It's ISBN #0942627318, and it's available from Amazon.Com. Leslie Ann Knight of KKUP-FM 91.5 called the group "one of the tightest blues bands in the Bay Area." Check out her review of Car Fixin' Blues online! The group was nominated for the Outstanding Blues Club Band award at the 19th Annual Bammies hosted by BAM magazine. The award went to fellow bluesmeister Tommy Castro and his band. Tommy was a featured guest on the album Car Fixin' Blues, so at least the award was kept in the family. And don't forget to check out Sadie O's thoughts on the matter! If you'd like to see the band live, (definitely recommended,) a performance schedule is available on-line.